Following weakness in China and Eurozone PMIs, US Manufacturing's final print for December also disappointed, dropping to 53.8 (below its flash print) to the slowest since Sept 2017.
Business confidence tumbled to its lowest since October 2016 and New orders hit a 15-month low. The rate of job creation softened to an 18-month low. Although firms noted an increase in workforce numbers following greater production requirements, others suggested that low rates of employee retention had weighed on growth. "Manufacturers reported a weakened pace of expansion at the end of 2018, and grew less upbeat about prospects for 2019. Output and order books grew at the slowest rates for over a year and optimism about the outlook slumped to its gloomiest for over two years. The month rounds of a fourth quarter in which manufacturing production is indicated to have risen at only a modest annualised rate of about 1%. “Some of the weakness is due to capacity constraints, with producers again reporting widespread difficulties in finding suitable staff and sourcing sufficient quantities of inputs. However, the survey also revealed signs of slower demand growth from customers, as well as rising concerns over the impact of tariffs. Just over two thirds of manufacturers reporting higher costs attributed the rise in prices to tariffs. “Growth was led by strengthening demand for consumer goods, and robust growth was also reported for investment goods such as plant and machinery. 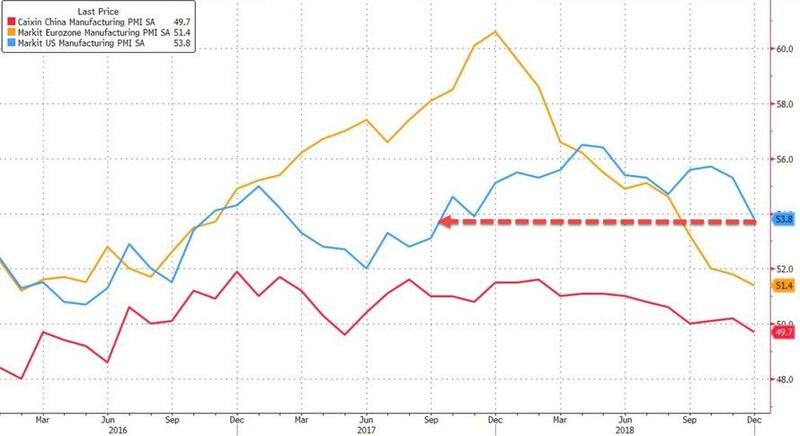 But producers of intermediate goods – who supply inputs to other manufactures – reported the weakest rise in new orders for over two years, hinting at increased destocking by their customers. 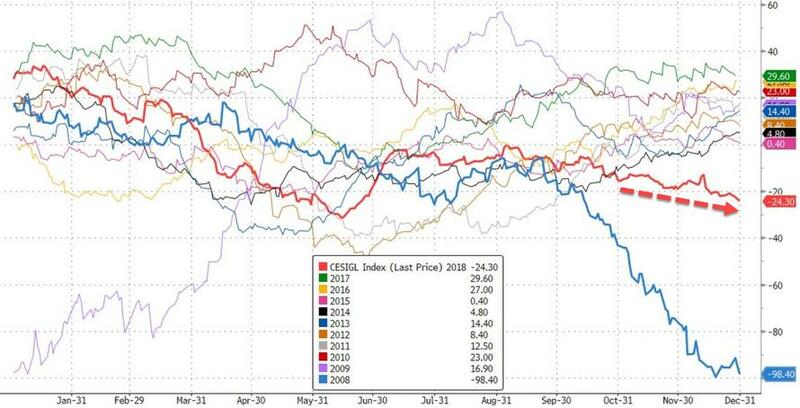 2018 marked the first time that Citigroup's global economic surprise index finished a year below zero since 2008, and China's disappointing PMI could help drag it even lower to start 2019. The consistency with which global data is trailing estimates makes consensus forecasts for U.S. GDP for 2019 that have barely budged from their high of 2.6% highly suspect. Appetite for risk in markets may be scarce until the data stops missing so consistently.